2021 – The London Jaguars win a playoff game – Is this more than just a dream? The year 2021, the date Sunday January 10, the venue the Budweiser Wembley Stadium, London, England……. THIRTY years ago the London Monarchs won the inaugural World Bowl in front of 61,108 fans inside Wembley Stadium. Fourteen years ago the NFL packaged two teams to play the first ever regular season NFL game in Europe in front of 81,176 fans inside Wembley Stadium. Tonight the NFL’s first ever non-North American based franchise, the London Jaguars, played and won their first ever Wild Card playoff contest in front of 87,263 fans inside Wembley Stadium. History was made when seven year veteran quarterback A.J. McCarron led the Jaguars through the wind and rain of North London on an eleven play touchdown drive, climaxing in a three-yard dive into the end-zone from fellow draft class of 2014 team-mate Melvin Gordon. The mud-splattered ball that crossed the goal-line in Gordon’s right hand was found on the sideline, and within days it will be flown first-class to Canton, Ohio to sit proudly in a perspex cabinet in one of the modern era wings of the Pro Football Hall of Fame. The 26-20 win against the visiting Miami Dolphins will go down in football folklore as the first post-season win for an NFL franchise based outside the United States of America. Before uprooting wholesale from Jacksonville, Florida, to the London Borough of Brent (just 12 months ago) the Jaguars had already etched their name into some significant post-season history books, as they, along with the Carolina Panthers, reached their respective Conference Championships just two seasons after inception. The Jaguars lost to the New England Patriots in the 1997 AFC Championship game. 24 years later and the Jaguars again travel to Massachusetts to face the three-time Super Bowl winners, this time two games away from competing for the Vince Lombardi Trophy. ……I could go on but hopefully you get the gist. I think this my small curtain twitch into the future is going to be more than just a dream. There is no way the NFL goes from one to three regular season NFL games in the same season in the same city without some sort of master plan to move one of the current 32 franchises, lock, stock and smoking barrel from the land of Uncle Sam to the land of Auntie Beeb. I have it fixed in my head that in 2020 the Jacksonville Jaguars will move to their new home across the pond and become known to the world as the London Jaguars. There will be uproar (loud animal sounding pun intended) as Roger Goodell announces in the 2015 NFL AGM that the five-year plan to get an NFL franchise in London begins with immediate effect. No doubt opinion will be divided in terms of this decision – ranging from being for the good of the NFL’s plan to take over the world to the other extreme that the state of the average Englishman’s teeth being that shoddy that players will not want to move continents to potentially risk dental hygiene distress. No doubt the President and our Prime Minister will be involved in terms of the mainstream media’s desire to get non-sporting column inches filled with this story between now and 2020, but I don’t think any misquote or inappropriate audible by a political head of state will derail this particular locomotive. Money talks, and there is no way that three NFL teams are giving up a home game in 2014 without being told that this is a long-term money spinner. I think that moving a team over here, but keeping their original NFL nickname and identity, will be the level of compromise that will keep the Jaguars owner Shahid Khan happy. Now all I have to do is get Mr Khan to confirm all of the above, for him to offer me a job on the communications staff of the London Jaguars and for me to persuade my wife to move the family to London. Hell, if you don’t shoot for the stars then you end up shooting in the dark. Everyone attending the Jaguars first ‘unofficial’ home game at Wembley Stadium tomorrow I hope you all witness a competitive and heartwarming game, and that most importantly you have a safe journey home. It’s anticipated that there is a storm brewing over England on Sunday. If we end up with the Jaguars moving permanently to London in 2020, it could be the longest storm in North American sports history. Bring on the thunder and lightning tomorrow (and I’m not talking about the resurrection of Ron Dayne and Tiki Barber). 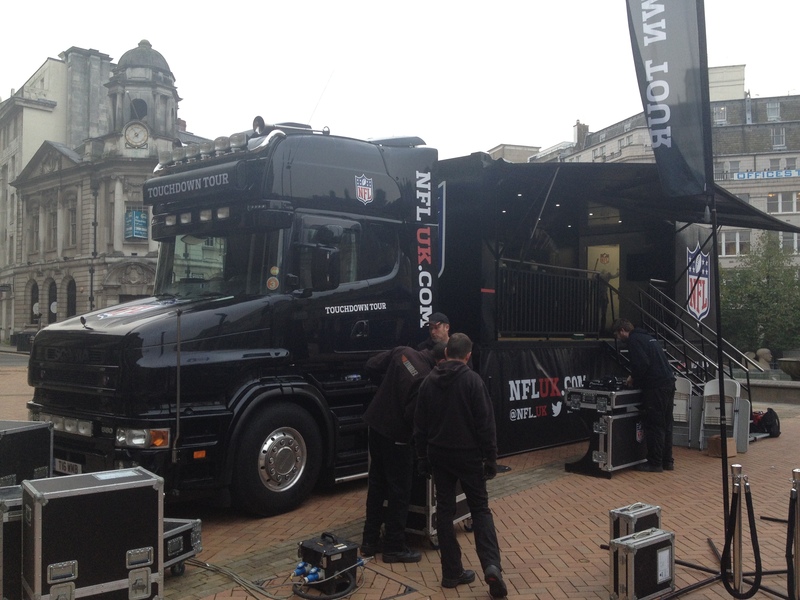 The NFL truck in Victoria Square, Birmingham, England. 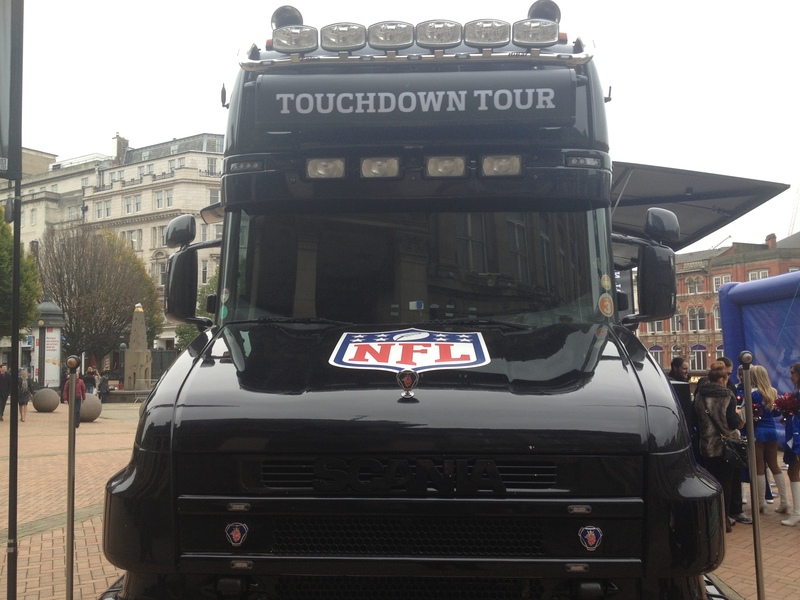 It’s not every day that you take your train commute to work in the West Midlands of England and find a giant NFL branded truck parked outside your place of work, but that’s what happened to me this morning in Birmingham city centre. 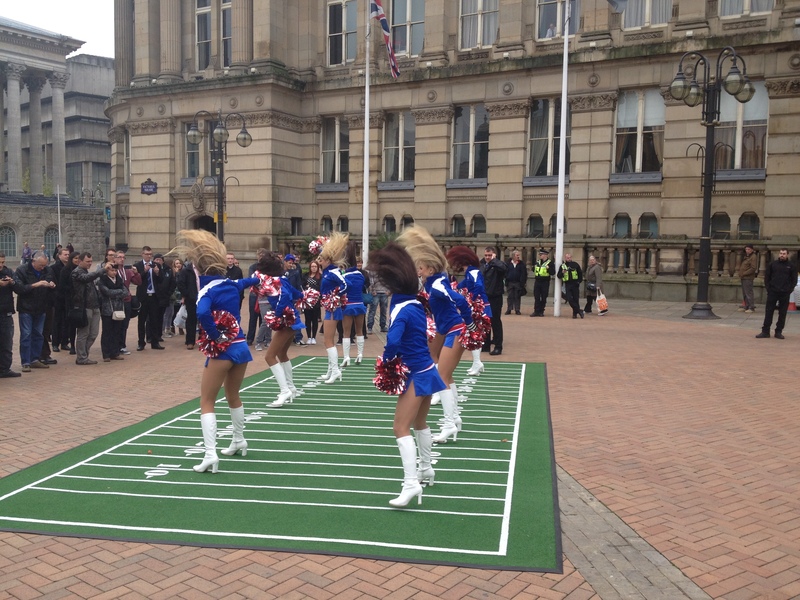 I knew the NFL were touring the Midlands and the South of England, but have to admit I forgot what day they were coming to Brum (as it is affectionately known by local residents). I walked past the truck before 9am this morning, and waited until my lunch break before coming out to see what the NFL had in store for the workers and shoppers in Birmingham. 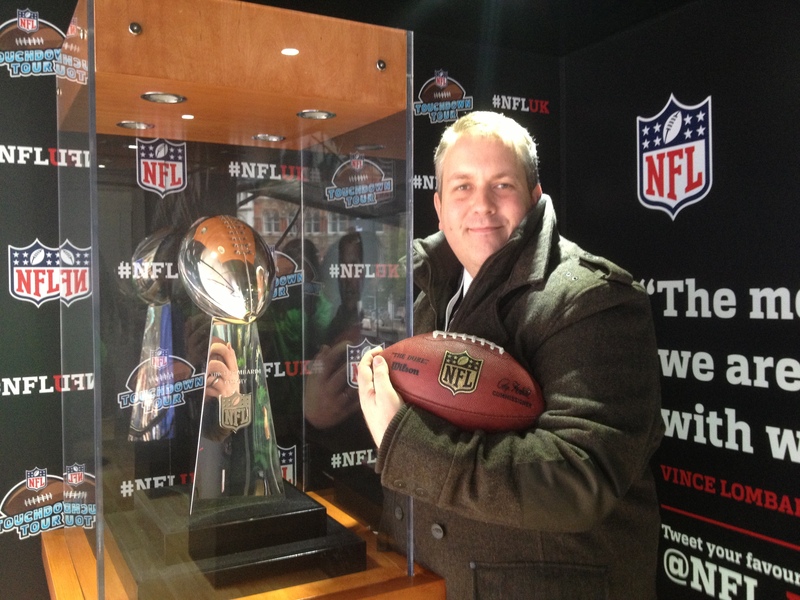 The highlight for me was to see the Vince Lombardi Trophy (for the third time). It was situated in a perspex cabinet inside the truck, watched over eagerly by a rather large and burly security guard. I had my picture taken with the trophy, and also the lady taking the pictures took a few extra for me using my own iPhone. This truck was at Wembley a few weeks ago for the Vikings v Steelers game, but at that time there was a one-hour queue to get the picture. Much better that I could just walk straight up the steps today and get within inches of the famous silver-mounted ball. 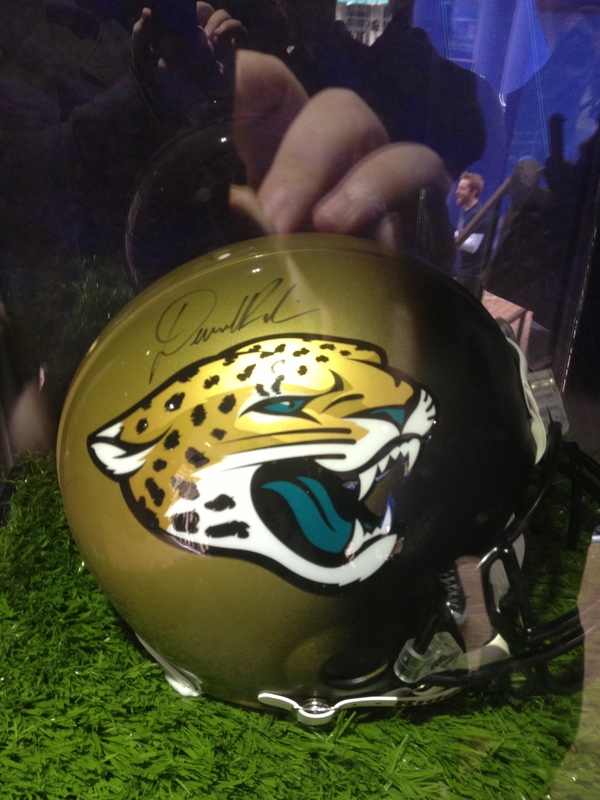 Along with the trophy was a signed Jacksonville Jaguars helmet, also in a perspex case. The helmet was signed by rookie OW (offensive weapon) Denard Robinson. As a huge NFL fan I was tickled that it was Robinson’s signature, as I had drafted the former Michigan quarterback in both of my 55 man roster fantasy leagues. Colin Kaepernick signed a ball. He played in his first Superbowl earlier this year. 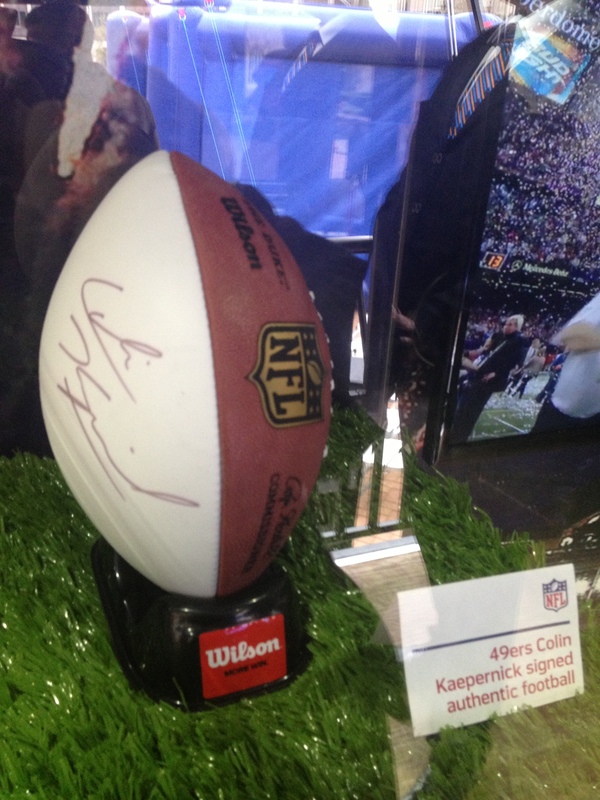 There was also a ball in the truck display, this one a San Francisco 49ers branded ball signed by its Superbowl losing quarterback Colin Kaepernick. The two pieces of memorabilia were on display to pre-promote the Jaguars upcoming ‘home’ game at Wembley against Kaepernick’s 49ers, taking place later this month. Unfortunately I will not be there as the budget only allows me to attend one NFL game in London a year, and I would always select seeing Adrian Peterson over Maurice Jones-Drew. Sorry Mo-Jo, I still love your little legs. I was disappointed that there was not that much to do, and the freebies handed out by the NFL were ok, but not amazing. They gave out Football 101 guide books which I have to say are a cracking introduction to the NFL for new fans. I also helped myself to a couple of sets of under-eye stickers that were NFL branded. There were no NFL players there when I attended (not that I expected anyone apart from maybe a retired or injured player), instead the NFL All-Star cheerleaders were there, probably wondering why they were performing to about 50 men with iPhones held aloft. They were offering signed pictures of themselves, which was a nice touch, but I did not recognise any of them and did not really want a signed picture of some random women, who for all I know could be the American equivalent of a Pineapple Dance troupe. 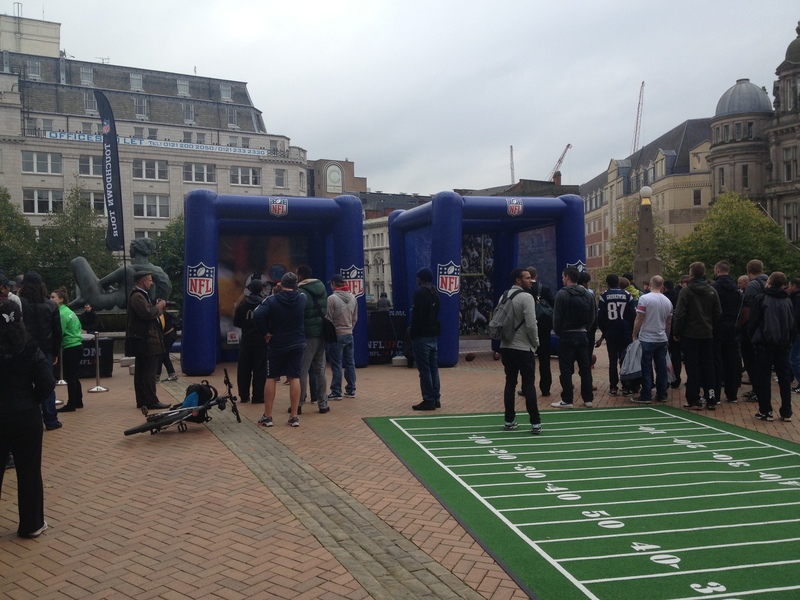 There was a rather bemused DJ spinning some cheesy tunes, and a few inflatable NFL displays where you could throw a pass or try a kick, but they were a bit undermanned and looked a bit unwelcoming with no sponge or turf floor around them. Overall a half-hearted effort by the NFL to try and spread the message about the greatest sport on the planet. I would have made sure schools were invited to take part and had some flag football displays, not just cheerleaders. Also some spot-prize giveaways would have been good, as would have been an ex-player or coach. Don’t get me wrong it was special to see the Vince Lombardi trophy in the city I work in, but more could have been done to get the message across that this sport will soon (by 2020) have an NFL franchise situated this side of the pond. Anyone who loves NFL fantasy football should play Action PC Football. It is an opportunity to run a complete team, complete with 50 to 55 man rosters. There are many dedicated Action PC Football commissioners and they all have different wrinkles to the way their leagues are run. I myself run two leagues the BBFL (Britball Football League) and the AMFL (Art Monk Football League). One League I am in called the KRFL (Knute Rockne Football League) has a TEN round Rookie Draft in May. Yes TEN rounds of rookies, OK it is a 24 team league, but drafting ten rounds of NFL Rookies (who will not play in the league until 2010) is quite taxing even for a devoted NFL fan like me. The task for me was made even more difficult due to two additional factors. I inherited a team that picked 23rd of 24 in every round, and I also had NO 1st or 3rd round pick. So with that set of problems, and a disadvantage of not getting to watch NCAA College Football here in England, here are the 8 picks I did make. Feel free to add any useful comments about my selections and thoughts …….. I hope this guy turns into the new Mike Vrabel, its great he can play so many positions. This guy can become the #2 RB in Jax, Fred Taylor is gone and there is a big gap behind MJD. Yes he rides the pine for a year, but is Shaun Hill or Alex Smith the real future of the Red and Gold? Gotta love my NittanyLions, what with the 08 Superbowl OL seen as one of the worst ever. I got some value here, and Quin could become the nickel back right away. This guy has pipe cleaner arms but is a good honest pass rusher. I’m hoping La-Rod becomes a Darren Sproles type returner and utility back. Kinder has some jets – check out this touchdown below. If he makes it through camp he could be a #3 or #4. As always I welcome your thoughts………..
Rashad Jennings – Biggest bargain in the 2009 NFL draft? When the Jacksonville Jaguars let Fred Taylor go this offseason they made a loud and clear announcement that Maurice Jones-Drew was THE number one running back on the team heading into 2009. MJD is great fun to watch and has a work ethic and a slight chip on his shoulder (due to his size), making him a great franchise back. MJD has produced good numbers on the ground and pretty spectacular through the air, but he has been supported by Taylor every step of the way. It was clear the Jags needed to get some form of support act for MJD, either through free agency or in the 2009 NFL Draft. With their first two selections Jacksonville played it very sensibly by drafting Eugene Monroe and Eben Britten, two extremely solid offensive tackles. Monroe and Britten will immediately help to clear the path for MJD, but it was the selection of Rashad Jennings, the running back from Liberty at pick #250 in the 7th round of the 2009 NFL draft, that interested me the most. Jennings could be the MJD support act, along with the rather active and athletic running back/full back Greg Jones. Jennings was predicted to go anywhere from the 2nd to the 5th round by many experts, so for the Jags to get Jennings in the 7th round must have felt like Santa Claus had started early in Florida this year. This guy was the leading rusher in the 2009 Senior Bowl but he still slipped down to pick #250, Jennings also helped Liberty to go 10-2 in 2008. I’m sure the Jaguars did not expect Jennings to fall in their lap so late, but it does leave me thinking why did 31 other teams decide not to call his name before pick #250. I have a good feeling about Jennings showing those other teams that they made a big mistake. Jacksonville will be a much improved team in 2009, with the likes of Torry Holt and Mike Walker stepping up at WR, Marcedes Lewis doing the do at TE and David Garrard showing he still has plenty left in the tank. Whilst MJD will be the star of the show I can see Rashad Jennings getting 300-400 yards rushing and 4-6 touchdowns. Any stats around this mark will be seen as great production for a 7th round pick, but I get the feeling for Jennings he will want a lot lot more. Anyone else have any thoughts on Jennings?